NASA Earth Observatory images by Joshua Stevens, using MODIS data from LANCE/EOSDIS Rapid Response, and National Water Information System data from the U.S. Geological Survey. Story by Kasha Patel. In a matter of hours on June 17, 2018, torrential rains transformed parts of Michigan into a “state of disaster.” Early morning storms swept through the Upper Midwest, creating flash floods, a few fatalities, and historic property damage. The potent storms developed when moisture in the mid and upper levels of the atmosphere from Hurricane Bud merged with a lower-level air mass rich in moisture. 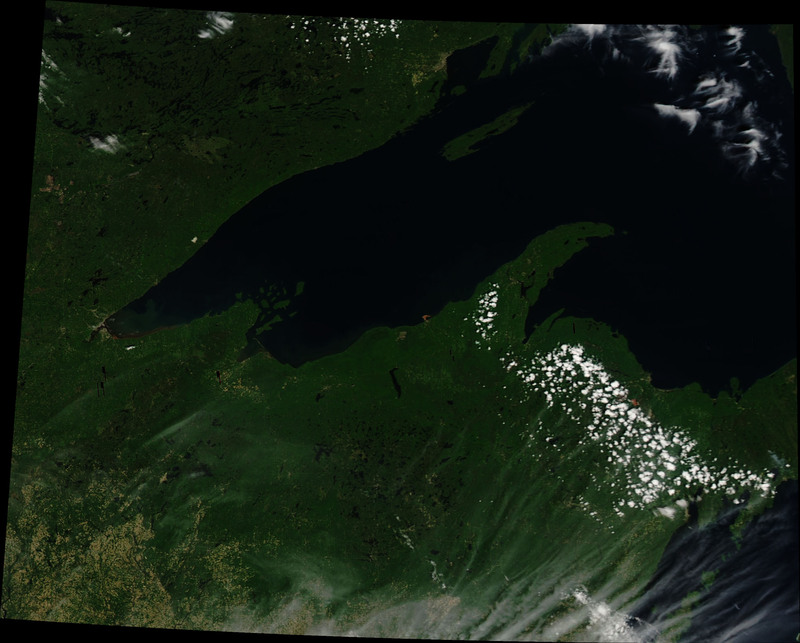 The torrential rains also affected parts of Wisconsin and Minnesota. 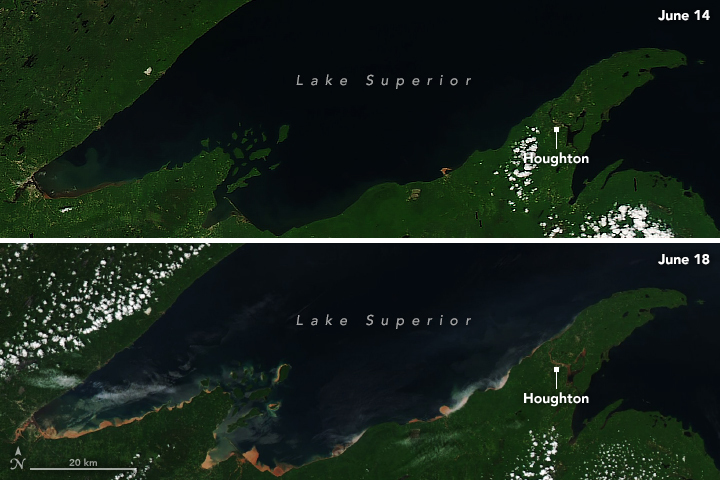 This pair of images shows the shoreline of Lake Superior before (June 14) and after (June 18) the downpour. Splotches of tan, red, and orange along the lakeshore indicate where rivers and streams carried muddy floodwater out of neighborhoods. The sediment is dominated by iron–rich soil called spodosols. 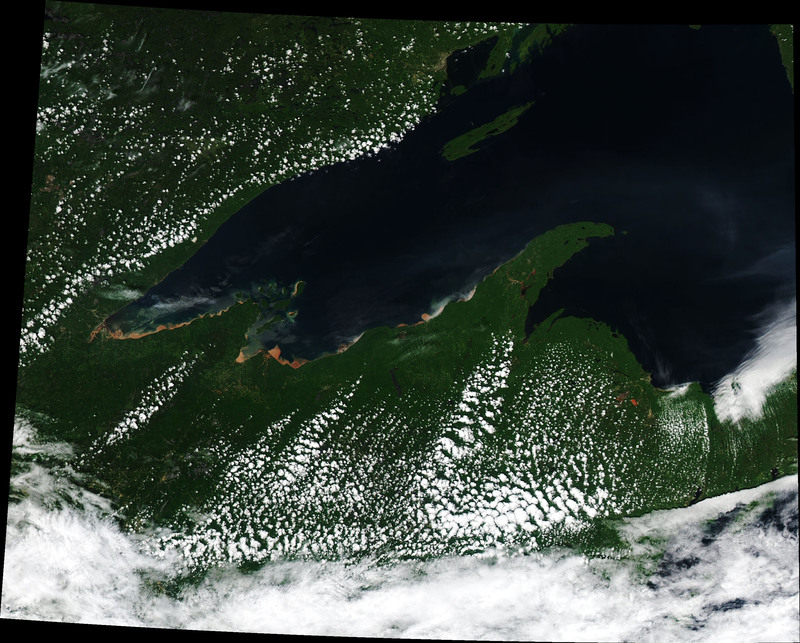 These images were acquired by the Moderate Resolution Imaging Spectroradiometer (MODIS) on NASA’s Aqua satellite. Houghton County was hit the worst in Michigan. The town of Lake Linden received between four to seven inches of rain in seven hours. 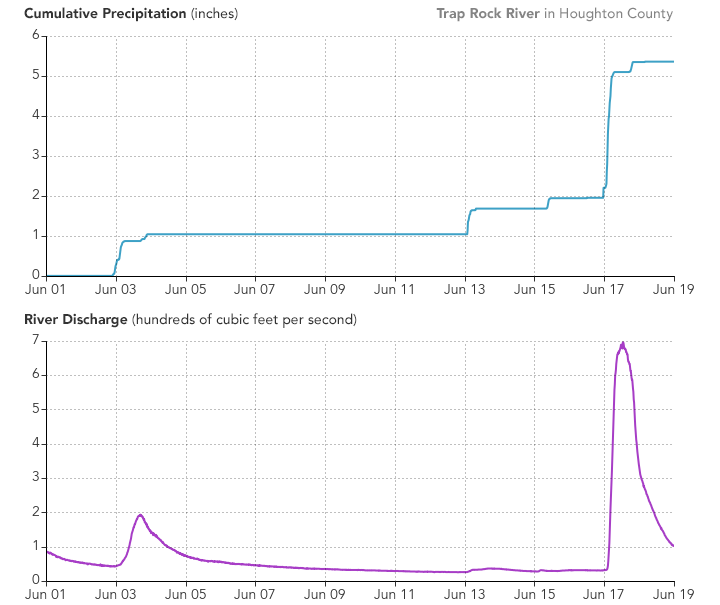 Nearby, the Trap Rock River received three inches, and its discharge was 331 percent above normal for June 17, 2018. The graph shows a connection between the amount of rainfall and river discharge, which is highlighted in the satellite image above. The graph shows how the increased rainfall over the area correlated with the high amount of river discharge for Trap Rock River. The data in this chart was provided by U.S. Geological Survey Water Resources. Detroit Free Press (2018, June 18) What we know about flooding in Houghton, Michigan. Accessed June 19, 2018. USA Today (2018, June 18) Flash flooding wipes out roads, damages buildings in Houghton, Michigan. Accessed June 19, 2018. US Geological Survey Water Resources Trap Rock River near Lake Linden, MI. Accessed June 19, 2018. Weather Underground (2018, June 19) A Flashy Flood Regime: Pockets of Torrential Rain Scattered Across U.S. Accessed June 19, 2018.